When working with SQL Server, as with any relational database, data is king. But data becomes less useful if you can’t gain access to it in a timely fashion. With so much data, being able to spread information across multiple servers allows for backup and quicker access. Replication is a technology available in SQL Server that facilitates the copying of data from one database to another in order to spread out load or provide redundant copies of data for high availability solutions. This Virtual Class, delivered by Microsoft SQL Server MVP Eric Johnson, will guide you into the world of SQL Server Replication. The class will start at the very basics of what replication is and the different types and topologies of replication that are common in today’s environments. It will then progress to more advanced topics such as Merge Replication and using Transactional Replication as a High Availability solution. The goal of the course is to take you from never having used Replication to being competent with the technology, and provide you with a solid base of knowledge on which to implement these solutions. You’ll learn what Replication is and how Replication can be used to create reporting and highly available environments. We will cover all types of replication and ensure that you know when each type is appropriate to implement. The class will also explore more advanced aspects of Replication such as peer-to-peer and updating subscriber replications. We will also look at troubleshooting and optimizing replication. By the end of the class you should be able to select, build, and maintain a replication environment and have a solid foundation of knowledge to draw on when things don’t go as planned. Eric has worked with all types of Replication since SQL Server 6.5. He is bringing his experiences and frustrations to you so that you can learn Replication quickly and correctly. Session 1 – Replication Overview – In this opening session, we will look at the structure of the class and what to expect for the next twelve sessions. We begin our tour with an overview of replication and a look at the different roles and agents involved in replication. After this session you should understand the different types of replication and have a working knowledge of the various moving parts, which we will dive more deeply into in later sessions. Session 2 – Replication Topologies and Configuration – This session will provide you with an overview of the various topologies and configurations in replication. We will look at some of the more common topologies and also begin working hands on with replication. We will cover the initial configuration of replication and look at setting up distribution, publication, and subscriptions. Session 03 – Snapshot Replication – In session 3, we will look at the simplest type of replication, Snapshot Replication. We will discuss basic configuration, the file locations used by snapshot replication, and some of the more common snapshot options. Since snapshot is used by the other replication types, we will be looking at it in more detail in later sessions as well. Session 04 – Transactional Replication – In this session, we look at the most common replication type, transactional replication. We will look at how you set up a transactional replication from a publication to a subscription. We will also look at the options available to perform the initial synchronization of your subscriptions. Lastly, we will look at the procedures that are created for transactional replication and look at the various options that you can set with agent profiles. Session 05 – Merge Replication – This session covers Merge Replication in all its glory. We look at the configuration and initial sync in addition to peaking under the covers at how merge tracks changes. Lastly, we will look at Merge Agent Profiles and talk a little about the Web Sync option. Session 06 – Special Replication Considerations – This session will cover things that you need to consider in replication outside of the data itself. We will look at how replication handles identities, indexes, and foreign keys. We will also talk about the NOT FOR REPLICATION option and tell you how you can backup your replication configuration with scripts. Session 07 – Using Transactional Replication for High Availability – This session will touch on a common use of replication, specifically setting up transactional replication to create a highly available environment. We will discuss the settings in replication that should be considered when setting up high availability, as well as the non-data elements that also have to be considered. Session 09 – Replication Security – Replication moves a lot of your data around and as such it must be secure. This session will cover the basics of replication security and arm you with the knowledge you need to correctly lock down your replication, and ultimately, your data. Session 10 – Optimizing Replication – Like anything that involves moving large amounts of data, replication is susceptible to performance degradation if it is not properly cared for. In this session, we will look at things you can do to keep your replication performing in top shape. Session 11 – Maintenance on Replicated Database – When you replicate a database, there are a few things that you need to consider when it comes to maintenance on that database. This session will talk about areas of concern and offer advice for keeping your maintenance going on your replication databases. Session 12 – Troubleshooting and Monitoring Replication – Replication moves a lot of your data around and as such it must be secure. This session will cover the basics of replication security and arm you with the knowledge you need to correctly lock down your replication, and ultimately, your data. Eric is the co-founder of Consortio Services, and the primary Database Technologies Consultant. His background in Information Technology (IT) is diverse, ranging from operating systems and hardware to specialized applications and development. He has even done his fair share of work on networks. Since IT is really just a way to support business processes, he has also acquired his MBA. 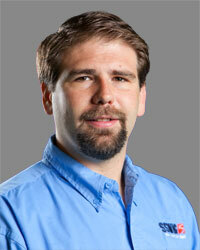 All in all, he has 10 years of experience with IT, a great amount of which has been working with Microsoft SQL Server. Eric has managed and designed databases of all shapes and sizes. He has delivered numerous SQL Server training classes and webcasts as well as presentations at national technology conferences. Most recently, he presented at TechMentor on SQL Server 2005 Replication, Reporting Services, and Integration Services. In addition, he is active in the local SQL Server Community, serving as the President of the Colorado Springs SQL Server Users Group.